When I found out that he was killed, I just sighed. I wish he was arrested and lawfully interrogated. I think we missed a crucial opportunity there, especially in breaking up ongoing al-Qaeda networks. In the past I read The Looming Tower: Al-Qaeda and the Road to 9/11 by Lawrence Wright (which won the Pulitzer Prize for General Nonfiction) and that book filled in a lot of gaps in my cable news channel lack of substantive knowledge. However, in response to his death, I bought both of Michael Schueuer's books, Imperial Hubris and Osama bin Laden, and finished the second book in about two days. It was a biography from a man who was the head of the CIA's Bin Laden Unit, charged with the task of hunting him down in the late 90's. I liked Scheuer's perspective, who takes Lawrence Wright's book to task a few times. 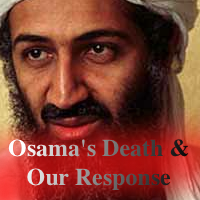 He wrote Osama bin Laden to break through the noise about the man and his al-Qaeda network in order to offer as accurate as possible an image of who the guy really is. Once we understand him and his motivations, only then can we effectively oppose his organization.